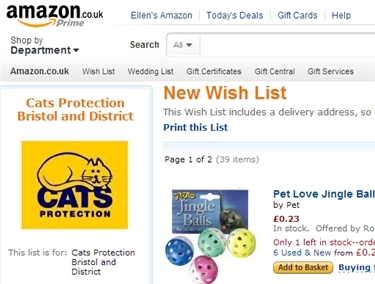 If you love cats and want to give a little but don't know how or have the time, why don't you take a look at our wish list on Amazon? With a click of a button you can donate food, blankets, toys and other items to keep the cats in our care happy. Prices range from as little as £3 to £15, with free P&P, and all items are delivered straight to us. Just click on the link below and search for Cats Protection Bristol under Wish List. Anything you can give is hugely appreciated. To find the Wish list log on to Amazon as yourself and go to "Wish Lists" you can search for a wish list. Type in either "Cats Protection Bristol and District" or the email address "catsprotectionbristol@hotmail.com" and it'll bring up our wish list. Or you can use the following link to take you straight to it. The Wish List is set it up for deliveries to be delivered to our branch shop.